Founded in 2005, West Michigan Compounding (WMC LLC) is focused on supplying products and services to help customers achieve significant plastic raw material cost savings. Our goal is to provide customers with alternatives to their costly virgin resins by delivering materials that have similar physical properties and consistency. With two operational facilities in Greenville, Michigan, our capabilities extend from compounding to plastic reclamation. Housed in a 25,000 square foot building, our compounding operations allow us to formulate, extrude, and test our products. At 440,000 square feet, our plastic reclamation center is used to sort, grind, wash (float/sink), pre-blend our feedstocks and post-blend our finished goods. In today’s competitive market, we have the capacity to compound and recycle over 100 million pounds of plastic per year. As experts in plastics compounding, we can produce both virgin and postindustrial compounded engineered thermoplastic resins. Each of our state-of-the-art, modern twin screw extruders possesses “loss in weight” feeding, dual venting, side feeding, strand and underwater pelletizing capabilities. From unfilled materials to specialty compounds and alloys, West Michigan Compounding has the proven experience to produce Engineered Thermoplastic Resins for your most challenging applications. Our breadth of materials include: PP, PC, ABS, PC/ABS, ASA, PBT, PA6, PA66, TPE (TPV, TPO). If postindustrial tolling is desired, we will actively manage your plastic scrap from “grave to cradle,” so your conversion facility can reuse its own scrap and recapture lost value. We ensure consistent, contaminant-free, repelletized, and certified material, so you can supplement your virgin materials. 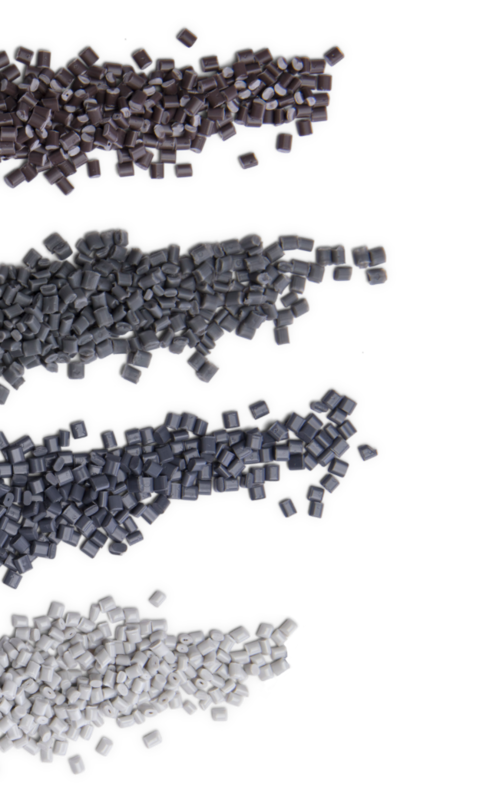 In many cases, we can also re-engineer your plastic scrap by inserting property enhancing additives and fillers. At West Michigan Compounding, our team is dedicated to offering innovative solutions, outstanding customer service, world-class quality, and on-time delivery for all your plastics needs. Quality is not only a hallmark of our products but also a characteristic of our people. At West Michigan Compounding, we are always searching for passionate, committed, and inspiring employees to join our growing organization. If you possess a strong work ethic and are driven by excellence, come establish a rewarding career with our WMC family. When plastics matter to your company, partner with West Michigan Compounding. We take pride in our unparalleled customer service and ability to deliver true innovation in plastics. Tell us how we can help reduce your overall material costs today.